I am not a huge shopper, but I do like to collect items that will take me back to the place and time of a trip, many years from now. On my first trip to the Middle East on Emirates Airline, I was headed to Dubai and expecting the unexpected. Along the way, while visiting the gold and spice souk, I couldn’t resist picking up a few things that would take me back to my travels to this desert metropolis. 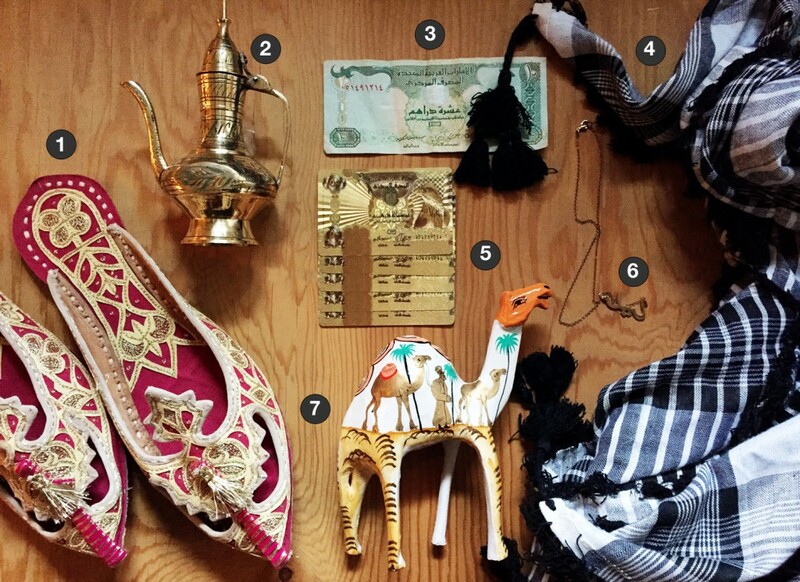 Insider Tip: At the Emirates Terminal 3 before you board your plane, look for souvenir shops. You will find quality items at a reasonable price—and it’s your last chance to get camel chocolate milk before you board! 1. These Aladdin slippers (Traditional Arabic shoes) are everywhere at the souks in many styles and colors for men and women. 2. Since I couldn’t fit the real deal in my small carry on, I took home this smaller version of an Arabic jar (coffee pot), perfect for my desk at home. 3. Money! Most people tend to just exchange all they have left over, but in my opinion I say keep it. What is $5 or $10 dollars in some other currency? Add it to your scrapbook for fun travel memories! 4. Arab Shemagh Keffiyeh Plaid Scarf. This one rocks! Looks great on anyone and is light, airy and keeps you warm. 5. Real Gold Leaf play cards. Yes, they sell them all over the place, but I had to take them home. Plus, the fact that they are 24K Gold is a perfect gift for the high rollers in your life. 6. If you are looking for that unique take away, head to the Jumeirah Madinat Souk and get a custom handmade necklace with your name written in Arabic. 7. Get a Camel. I purchased this one at the airport at Emirates Terminal 3 at a good price. Also, look for the only camel chocolate milk bars around, very creamy and delicious.